White, 88, served Temple as a football player, coach and athletic director from 1949–88 and is a member of the Temple Athletics Hall of Fame. He remembers a time when local rivalries dictated football schedules and the athletic department prided itself on the success of its Olympic sports. Last December, Temple announced it would be eliminating seven of those sports – later reduced to five – to cut costs. White’s son, Gavin R. White, was among those affected. After coaching crew for 34 seasons, White’s team was included in the initial plan to cut sports, though the crew and rowing teams would later be reinstated. When the older White first learned of the university’s decision, he was floored. A review of the football team’s history shows that an inconsistency in institutional support has prevented Temple from building and maintaining a reputable program. Experts say two periods in the university’s history – the 1950s and the 1980s – when the administration didn’t invest heavily in athletics created rifts in the football program’s momentum. A trend line showing the history of the football team’s win totals shows that the Owls were losing on the field during two periods that the university didn’t invest heavily in athletics. In the newly formed American Athletic Conference, Temple has the second smallest athletic budget ($41.5 million) but is tied for the most number of sports sponsored (24), according to the most recent data from the U.S. Department of Education. Officials pointed to that discrepancy as a main reason for the cuts. The athletic department estimates that cuts to the men’s gymnastics, baseball, softball and men’s indoor and outdoor track & field teams will save the university $2 million to $2.5 million. President Theobald and Athletic Director Kevin Clark both deny that the football team was the root cause of the cuts and brush off the notion that the leftover money will be funneled into the upstart program. However, few would dispute this: In the post-BCS era, a university’s athletic department lives and dies with its Division I football program. The football team’s role in sponsoring an underfunded athletic department raises questions about its implication in the cuts. Even more troubling to some, its inconsistent history doesn’t stack up to the storied traditions of other non-revenue sports that were eliminated. Men’s gymnastics coach Fred Turoff speaks during a Board of Trustees meeting in February. Turoff, along with coaches of the other affected programs, tried to convince the board to reverse its decision to eliminate his team. The men’s gymnastics team is no stranger to the prospect of elimination. In December 1994, R.C. Johnson, who was in his first year as Temple’s athletic director, proposed the elimination of men’s gymnastics, along with the women’s gymnastics and baseball teams. The announcement of Johnson’s proposal was made 11 days before the Board of Trustees voted on the matter. The team took advantage of that time. Turoff’s team, as well as the women’s team, took action. The Owls gathered in front of Johnson’s office at 1900 N. Broad St., looking to get a word with him. It worked, despite not getting the opportunity right away. Twenty years later, the team is in nearly the exact same position. 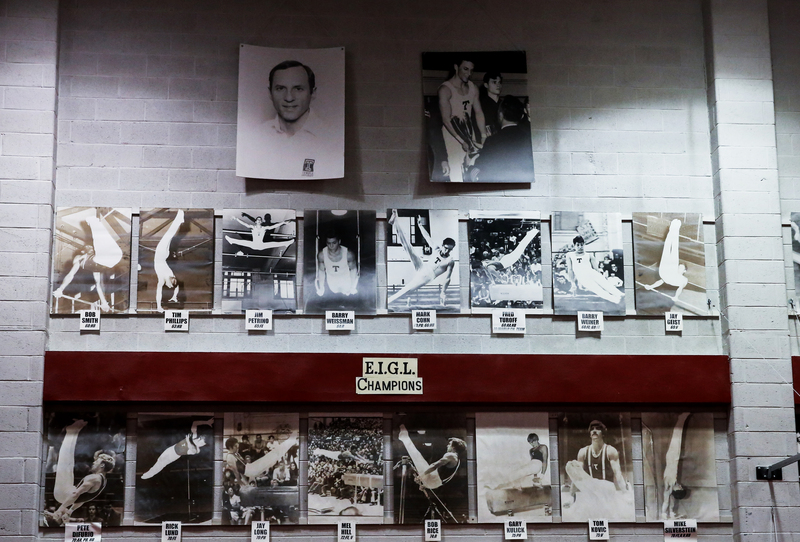 The walls of McGonigle Hall are decorated with the achievements of the historical men’s gymnastics team. Since 1926, the team has won 26 conference championships, the most of any Temple athletic program. With the program coming off back-to-back Eastern College Athletic Conference titles and accumulating the best grade point average out of all the teams in the school during the past three years, including the best grade point average out of any college gymnastics team in the country in 2011, Turoff never expected the announcement last December that his team was being cut. In a February vote, the board reinstated the crew and rowing teams but reaffirmed that men’s gymnastics, men’s track & field, baseball and softball will remain cut. In 1994, the cuts were nothing more than a proposal, as no decision had been reached. Now, they are a reality. Still, members of the team said they haven’t lost all hope. “We’re doing everything we can to influence public opinion and the opinion of the administration,” Turoff said. Like in 1994, the team created a petition in support of preserving the program, but brought modern-day strategies into the fold. Alumni created T-shirts utilizing the “Keep Calm” meme with “Keep Calm and Save Gymnastics,” and sent letters to Theobald and board members. There is also the Perfect 10 Campaign, which aims to help raise funds via donations of $10 or more. The proceeds go toward challenge grants that, if raised, will be matched by trustee Lewis Katz to fund the budget moving forward. Three-time All-American Travis Mahoney became the most decorated distance runner in the men’s track & field team’s history during a five-year career with the program. Mahoney said after the announcement of the cuts that he feels “betrayed” by the program. As a ripe collegiate track prospect at Cardinal Dougherty High School weighing his potential Division I opportunities, Paul Hines never really had a choice. Growing up in the Oak Lane section of Philadelphia, Hines went to school and ran with Jack “The Saint” St. Clair’s children, and saw the coach frequently during services at Holy Angels Parish in the city. 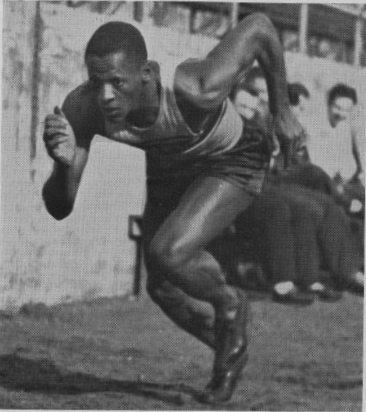 A rival of Jesse Owens, Temple sprinter Eulace Peacock tied the world record for the 100-meter dash in 1935. Hines wound up running for the man he’d known for the better part of a decade starting in 1972. Now a longtime track coach for the boys’ and girls’ teams at Springside Chestnut Hill Academy in Philadelphia, Hines occasionally looks back on what panned out as a productive career at Temple. His accolades include a career-best 4 minute, 10-second time in the mile, and being part of Temple’s 1974 distance medley relay that at one time held the school record. Now coaching the sport that he once made his niche, Hines has watched his former schools – and teams – drop by the wayside. His high school, Cardinal Dougherty, shut its doors in Spring 2010. So did his former elementary school. The school in which he’s nestled a comfortable track coaching career, formerly Chestnut Hill Academy, is now Springside Chestnut Hill Academy as the result of a merge. All were changes made within a few years. All occurred before the hammer dropped last December in the form of the athletic cuts announcement. As is the case with every program affected by the cuts, men’s track & field has its share of history and stories – some frequently talked about today, others lost in time. Eulace Peacock, who was once considered the fastest man in the world and a rival of Jessie Owens, donned the Temple ‘T’ across his chest. Bill Cosby attended the university on scholarship to compete in track as his primary sport, not football. Temple track & field enjoyed the guidance of a full-time coach for the first time in 2004, 18 years after the loss of its cross country program. And while cross country was reinstated in 2005 and will continue, men’s indoor and outdoor track & field will bow out as a Division I program for the final time on July 1. 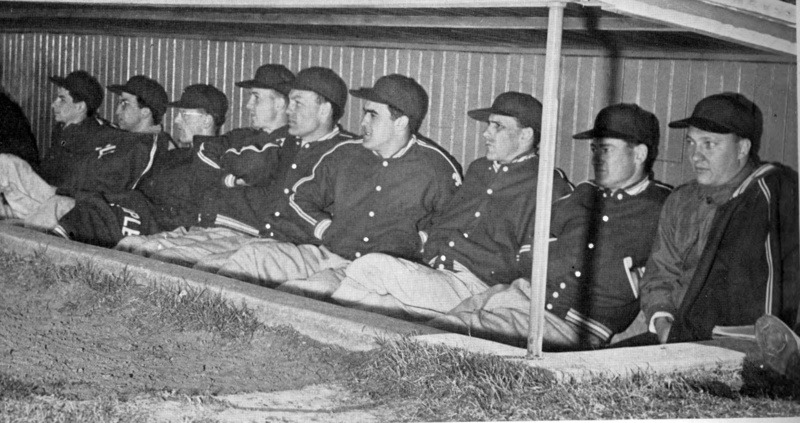 Members of the 1948 baseball team take in a game from the dugout at Erny Field. The team played home games there for its first 78 years before moving to the Ambler Sports Complex in 2004. To this day, the baseball team has never played a game on Main Campus. The program played its first 78 years at Erny Field in Mount Airy before moving to Skip Wilson Field at Ambler Campus in 2004. The baseball team has had three home facilities during its 87-year history. Wilson said he doesn’t know why the program left Erny Field in favor of Ambler. “When they compare it to other fields, it’s like a Little League field,” Wilson said of the field that has his namesake. The lack of an on-campus facility was one of the many reasons the university used to justify the baseball program being cut. Playing off-campus is a reality known to every Temple baseball player before they enroll at the university. A solution to that problem was thought to be settled last November when coach Ryan Wheeler – with the assistance of Clark – helped strike a deal with Campbell’s Field in Camden, N.J., to host 11 of the team’s 12 home games against conference opponents. Campbell’s Field, home to the Camden Riversharks, was named “Ballpark of the Year” in 2004 by Baseball America. “We are truly excited to be able to provide a first-class venue for our team to perform in this historic season,” Clark said in a statement released Nov. 7. Less than one month later, Clark recommended cutting the program. In 2010, an event occurred that many argue shaped the softball program’s future. 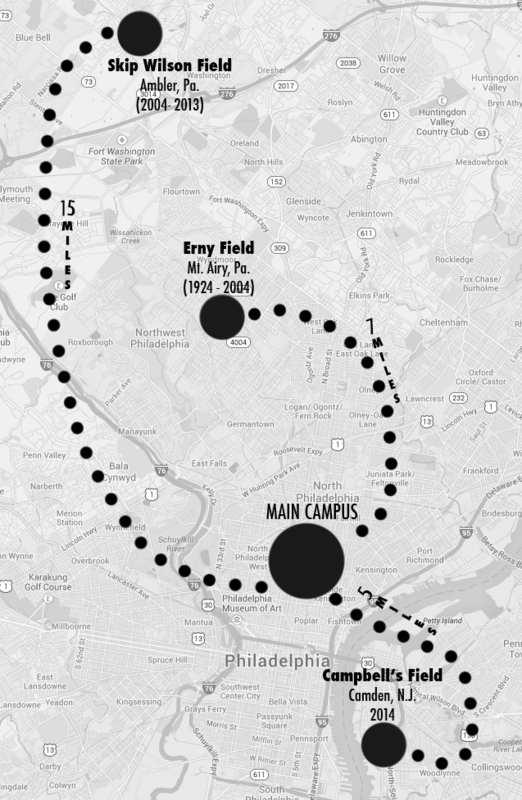 The administration decided to close the dormitories on the Ambler Campus. Freshman catcher Kaylyn Zierke prepares to practice at the batting cages at the softball team’s indoor facilities. The Owls compete at the Ambler Sports Complex, but often practice on-campus. Despite this, the Owls revamped their stadium between 2011 and 2012. The team installed a press box, painted the dugouts and amphitheater seating, added bleachers and renamed the venue the Temple Softball Stadium. Much of the renovation was instigated by DiPietro. Under DiPietro, the team had increased its win total each season heading into 2013. That year, the Owls won 32 games – breaking their single-season record. 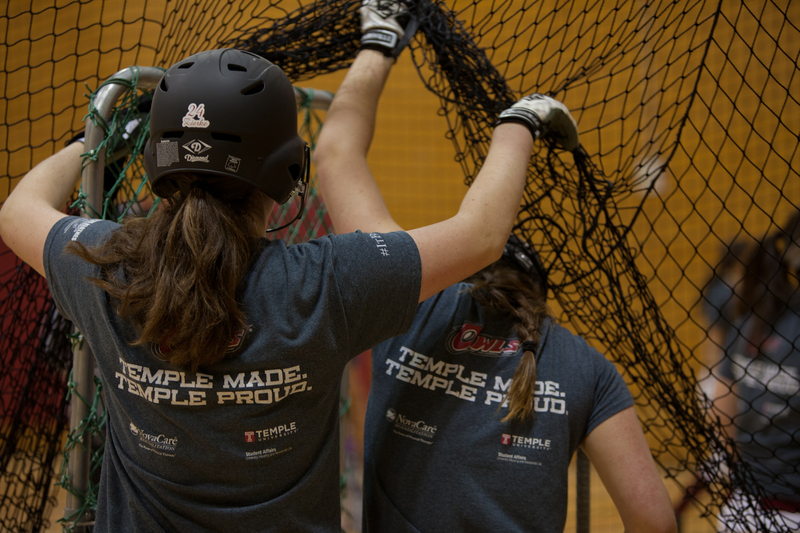 For the 2014 season, Temple moved most of its sports, including softball, to The American. But the first season in a new conference will also be its last.